New kindergarten children and the blind boy. Pictured are the new intake of Kindergarten children, it is expected the number will be around 45 that start pre school in October 2012. Fortunately we were able to place all 90 children aged from 6 to 16, being taught by CHOICE, into the local Governmet School. 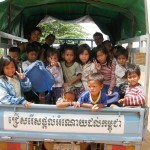 We continue to transport these 90 children to and from school as well as provide uniforms, back packs, books etc. Some 30 of these still attend the CHOICE Center for english and computer lessons. Tad (pictured) is a regular volunteer and in charge of the Village water run. Tad takes special care of the blind boy from the middle Village. He often puts the boy in the front of the truck with him and lets the lad enjoy the ride. On this occasion Tad has brought the boy in to Sundance Inn to enjoy a dip in the pool. Well done Tad.